The piping system used to deliver compressed air throughout your facility is very important. Its material, age and condition affect both reliability and air quality. 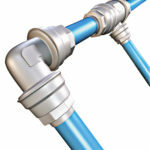 Quick-lock aluminum piping is the world’s only totally metal push-connect piping system with many advantages over all current push-connect systems. It is the only push-connect system that fully complies with the ANSI B31.1 piping system code. No special tooling is needed to install the Quick-Lock system, and has electrostatic powder coating for all internal and external applications. 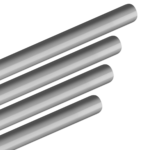 Piping made with iron will rust and corrode, creating buildup on the interior and reducing air flow capacity. This will also contribute to contamination and poor air quality for your downstream processes. Remember: Plastic is for Toys. Don’t Settle- Choose Metal. Download our Quick Lock Tubing Brochure or contact us today.